Talk to the Talking Cat. 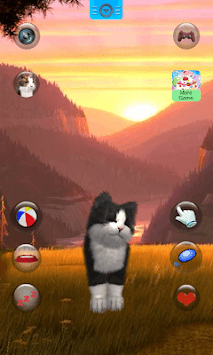 The cat answers with her funny voice and reacts to what you say or your touch. Maybe you like cat super, super want to keep one as a pet, but can not do so intolerable family or roommates，or too busy to care them. Now we have Talking Cat. There are some very cute cats. They likes to run and jump, like to play game with you to find the ball. There are Abyssinian, American Shorthair, British Shorthair, Japanese bobtail and Russian Blue cat waiting for you. Hope these cats can accompany you to have an exciting time. You will collect cat, train them to level them up and send them to quests for exciting in-game rewards! If you like these cats, share them with your friends, your parents, lovers, oh we must ensure that they like cats as you like them. 🐱 Talk to cat and cat will repeat after you. 🐱 Laugh out loud at cat’s funny voice. 🐱 Talking to the fifteen different cats. 🐱 Share funny cat picture with your friends. 🐱 Touch the cat to make her happy. 🐱 Where is the ball, find it and play with cat. 🐱 Let cat to sleep. 🐱 Cat playing color ball. 🐱 Poke or slap cat's face, belly and feet. 🐱 Different cats can collect and more to come. 🐱 Watch how the cats play and sleep peacefully. 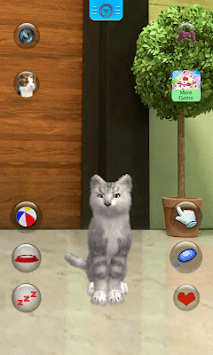 Talking Cat is a free game. Willing Talking Cat accompany you to spend a happy time. 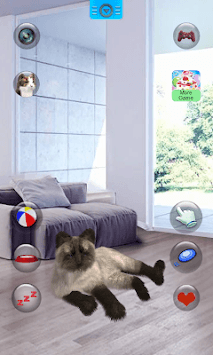 Download now and start having fun with lovely cat!